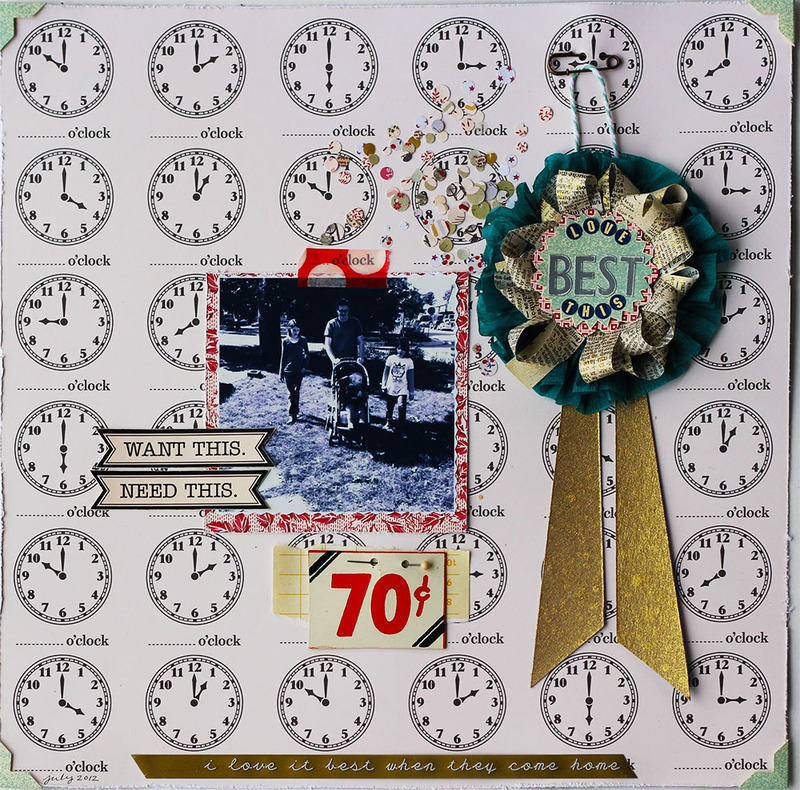 This is another page made with the Jenni Bowlin Mercantile November Papercrafting kit. It was a great kit -- chock full of brand new JBS products, like her new Red and Black collection. 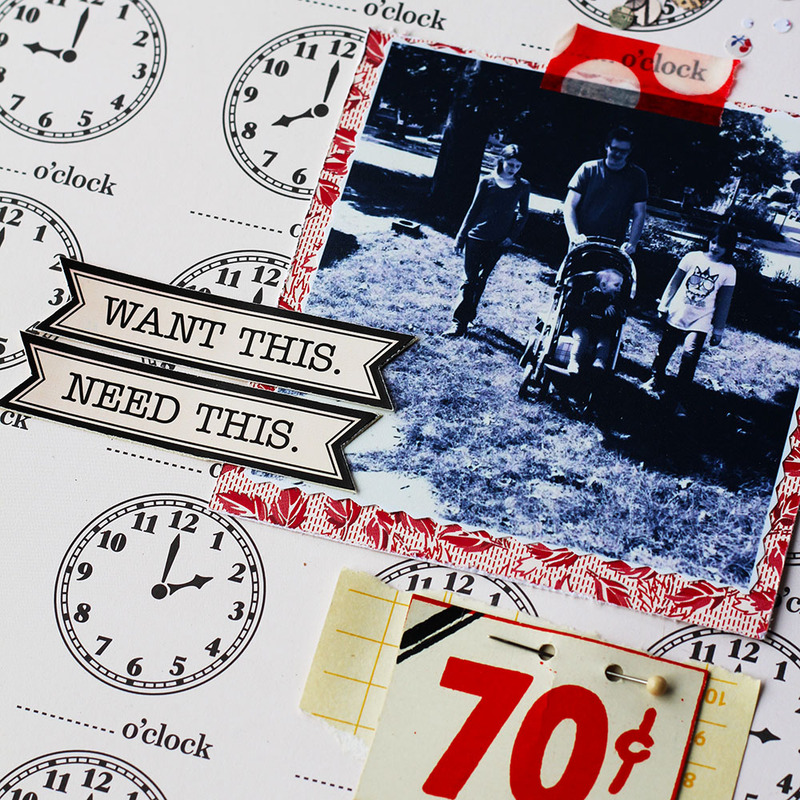 I loved this clock paper from the moment I saw a sneak peek earlier in the month. I had this photo of Paul and our girls coming home from a walk, and the clocks made me think that my favourite time is truly when they all come back home. Whatever time of day that is. ;) So the clocks all showing different times seemed like the perfect companion of this Instagram print. And, another fair ribbon! You have have noticed that I've been loving these lately. Not sure where this love came from, but I do totally love making these little prizes for my pages. There is just something so celebratory about them. And when I think about it, my scrapbook pages are like little celebrations of my favourite things, so fair ribbons DO seem like fitting embellishments. 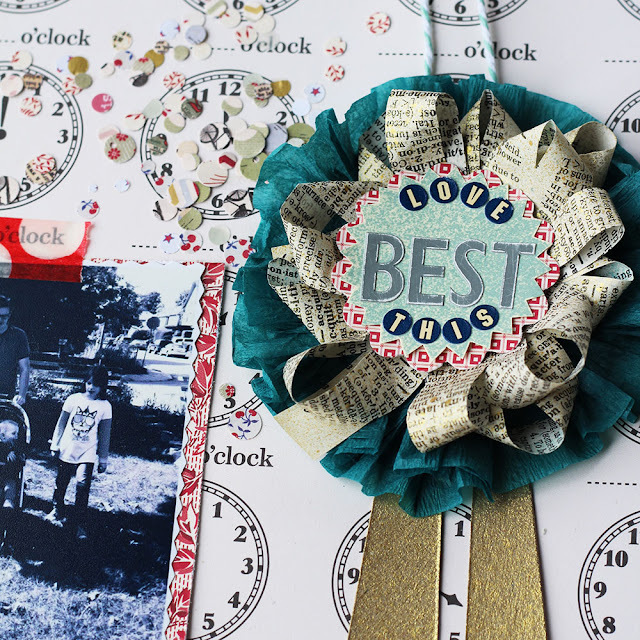 This fair ribbon was made from a diploma seal misted with October Afternoon Robot Blue Sprinkler, using the cool mask included in the November JBS Papercrafting kit. I layered a scalloped punch from the mini sheet paper behind it. Then I looped together some misted book page scraps and used some of my favourite teal crepe paper streamer to fluff the whole thing up some more and add a bit of colour. The tails are actually left over pieces that I used as a starburst mask on another page. Always keep your cool scraps! Especially if they were misted with Heidi Swapp Gold Lame Color Shine -- that stuff is amazing! To make this page feel even more celebratory, I tossed a pinch of confetti down, too. This red washi tape with the huge white polka dots that was included with the November Papercrafting kit is way too fun. I punched small holes in one of the vintage price tags so I could run a pin through it. The JBS Hear Ye, Hear Ye banner stickers included in the kit I thought summed up the sentiments behind this page quite perfectly! This is absolutely lovely! I am so in love with that prize ribbon!! Such a great layout, and I love that clock paper, too!